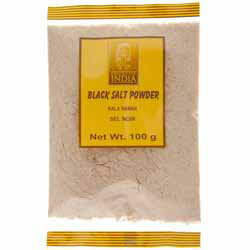 Black Salt Powder, also known as Kala Namak, is a reddish-grey mineral salt with a sulphurous, hard-boiled egg taste. It is used to impart the characteristic tangy, fresh flavour to chaats, chutneys, fruits, raitas and many savoury Indian snacks. "Dear Spices of India, I received my order within a couple of days and my package was excellently wrapped. The lady I spoke to on the phone was very friendly and helpful. I have yet to try the products but I am sure I will love them!"